Summer in Korea is hot, muggy, and filled with mosquitos so a bit of preparation is needed to make life comfortable, cool, and bite-free. 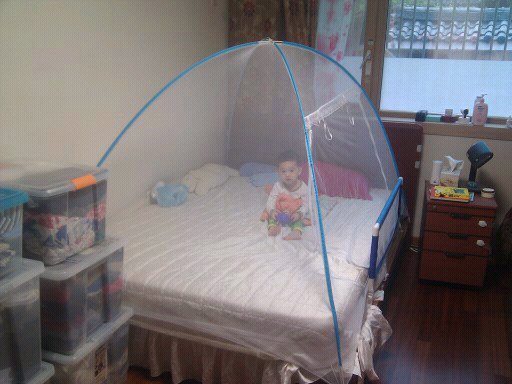 We decided to buy a mosquito tent a few days ago, right around the time the skeeters come out in full force (end of May, beginning of June). We bought this at Homeplus for 35,000 ($30 US) and it fits three of us comfortably. There are a range of skeeter tents available from little ones for baby-only to 8 persons. The cheapest I saw was for 10,000 and the most expensive around 50,000. You can also order from Gmarket, the Korean word is 모기장.